and holding sceptre in left hand. A seated captive between them. Temple has wolf and twins in pediment and victories as acroteria. Minted at at officina Gamma in Aquileia (Italy) offcina T in the late summer of 307 A.D.
Sutherland, C.H.V., "Roman Imperial Coinage", Volume 6 (RIC), Aquileia, p325, nr 113.
hinterlassenen Sammlung und Aufzeichnung des Herrn Paul Gerin" (Voetter-Gerin), Aquileia, Maxentius, p65, #3. 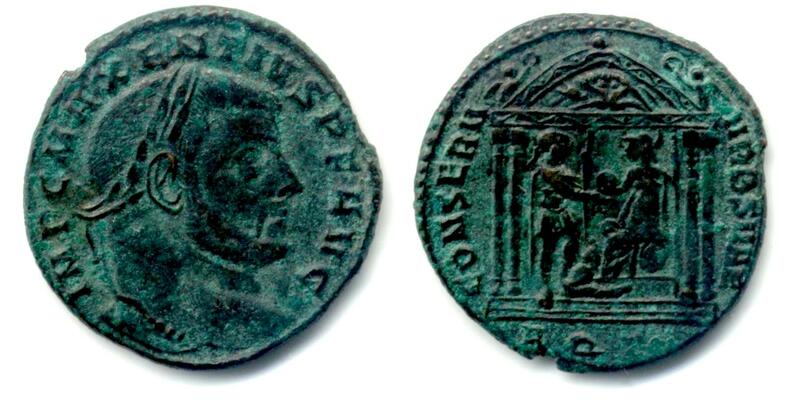 Failmezger, V., "Roman Bronze Coins From Paganism To Christianity 294-364 A.D.", nr 126gM3. Van Meter, D., "Handbook of Roman Imperial Coins", p284, nr 19.